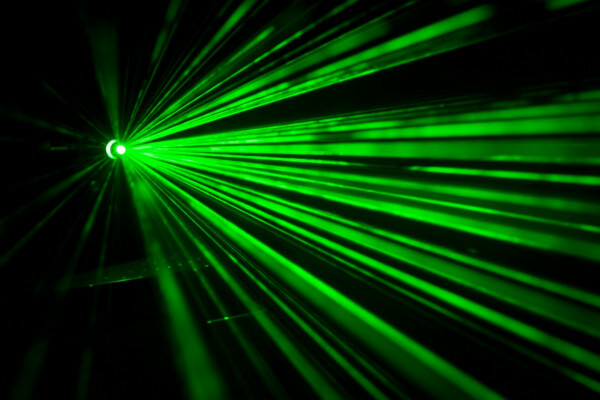 Why do we need different coloured lasers? How does a laser’s colour affect how it works? What does the colour means in terms of a laser's application; what can we do with it? Chris Smith put this question from Amy to physicist Jess Wade from Imperial College London. Jess - We can excite loads of different things with lasers and we actually use them a lot in physics to look at different molecules and to understand stuff about different atoms. But actually I thought about this in a different way which was how do we generate different colours of laser light? And there it’s really really really interesting. To get a laser at all we need some kind of thing that will be the kind of lasing medium, and then we need something to excite this medium, and then we need a bunch of mirrors. And to get a laser to work we basically excite an atom or a gas or a dye up to an excited state. So we take the little electrons that are usually in their ground state, put them in an excited state. They’re not very happy there and really quickly jump down emitting a photon of light. And the mirrors are there to bounce that photon around a lot of times so it keeps triggering and emitting more and more photons until eventually there are enough of those to escape through one of these mirrors. And you can generate this kind of light in lots of different ways. Sometimes you do it with gases, sometimes we do it with dyes, sometimes we do it with semiconductors like the LEDs that I work with. And all of those different things can get different colours. But actually, when you’ve got a laser light at the end of it you don’t really know what the origins of it were unless you built the laser yourself because the colour, you know, is just monochromatic. It’s one wavelength and that’s what a laser really is. Chris - But we can choose the colour depending on the application, can’t we? So people can use certain wavelengths of light, certain colours of light if they want to say, cut tissue if they want to use a laser for surgery. You’d use a different colour presumably if you wanted to cut steel? Jess - Exactly. And the laser light, the colour of the light determines the energy that that laser light will have. So you can use a really high energy laser, a kind of ultraviolet or a blue laser, or a lazy infrared laser if you want to look at something that isn’t quite so high energy to be able to excite it. Chris - And Donna Strickland who got the Nobel Prize for her work on lasers, her breakthrough was making the pulses exquisitely short. Why did that matter? Jess - She wanted to be able to generate huge amounts of power over a very short increment of time, and they actually had huge innovations later in doing things in the eye. So these were really really short pulses of very powerful lasers that then you could use to treat conditions that were in your eye. I think the most amazing thing about Donna Strickland, other than this innovation in laser technology, was that she did this while she was a graduate student and this was the first paper that she every published. Chris - First paper that she ever published won her a Nobel Prize. Jess - Which is just so neat! And then went on to have a really phenomenal career in Canada. But what an inspiring and wonderful thing to do. And for every PhD student listening there, you’ve got a huge responsibility now. Previous Why are some people hooked on adrenaline? Next Do animals have different vocal ranges? Is climate change altering weather? Why are highlighters so bright?